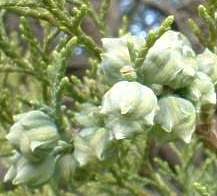 Widdringtonia nodiflora is a bush/tree with a columnar crown and attains a height of 5-7 m. The slender and upright form of the mountain cedar during its juvenile phase is similar to most conifers, and so is popular in formal gardening. For those living at the southern tip of Africa, Christmas can be a bit of an anticlimax! First and foremost, the sunny weather wreaks havoc with the romantic notion of a white Christmas, and the days of that other Christmas institution, the pine tree, are almost numbered! So what are the alternatives, if any? 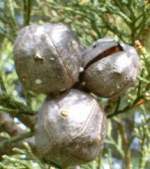 Well, one can start by purchasing a mountain cypress and growing it in a pot. In no time this potplant will provide you with a superb Christmas tree. When it becomes too big for the pot, plant it in your garden. As it eventually matures, you can actually prune some of the lower branches during the festive period to be used as a tree. As for snow, one probably has to go the fictional route by dreaming of it. However, one thing is clear; this indigenous tree will make an exceptional substitute for the pine tree. It is also water-wise, is not a fierce competitor with other plants, and has a pine-like shape. By introducing this gem to your garden you will undoubtedly be proudly South African and possibly herald an era where we truly have a Christmas the African way! 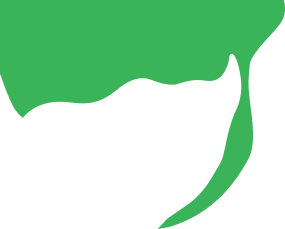 During the juvenile phase, the needle-like leaves are a fresh green and spirally arranged up to 20 mm long. The dark green, scale-like leaves are about 2 mm long and normally appear after 7-8 years. Both the sexes appear on the same plant with cones produced en masse all along the smaller branches. The 4 mm long, yellow-brown male cones are found at the tips of the branchlets. The dark brown, globose female cones are about 15-20 mm in diameter. They mature to reveal flat, black seeds with a conspicuous reddish wing. 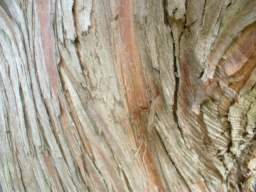 The thin and fibrous bark is brownish grey and flakes in fine strips to reveal a reddish underbark. Widdringtonia nodiflora, with its relatively widespread occurrence, is not a threatened species. The mountain cedar occurs naturally from the southwestern Cape through KwaZulu-Natal to parts of Zimbabwe. It usually grows between rocks, and in gullies on mountainsides, among fynbos and grassland types. These fine-leaved trees are normally confined to small communities appearing at relatively high altitudes. This species occurs naturally on the mountain above Kirstenbosch. The genus Widdringtonia was named after Edward Widdrington, a Royal Navy captain and conifer botanist of the late 1700s and early 1800s. The species name nodiflora means 'flowers at the nodes'. 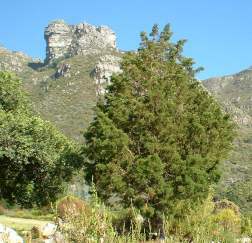 The genus contains only three species, the others being Widdringtonia schwarzii (the Willowmore cedar), and the critically endangered W. cedarbergensis (the Clanwilliam cedar). The common name cedar is sometimes used, a name which is loosely applied to certain trees with a fragrant wood, derived from the pleasant aromatic oil (resin) which is produced. Both fynbos and grassland biomes are prone to seasonal veld fires. 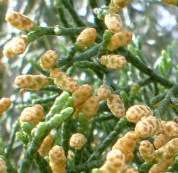 The mountain cedar contains resin in its bark and leaves which makes it highly inflammable. Burnt trees usually resprout from the base after a fire. The durable timber makes attractive silver-grey roofing shingles. The wood also possesses a satiny sheen which makes it ideal for furniture and panelling. Exquisite kists, made in the 1800s by pioneers in the Chimanimani District of Zimbabwe, are evidence that some huge trees must have grown there at some time. 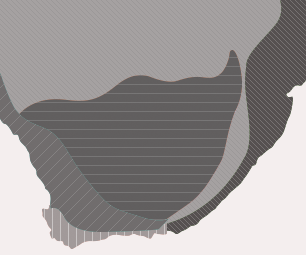 Currently, very few sizable trees are growing south of the Zambezi River. 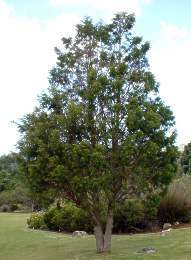 The mountain cedar is propagated from seed sown during autumn in a well-drained, sandy soil. Use either coarse river sand or a 1:1 mixture of compost and river sand. 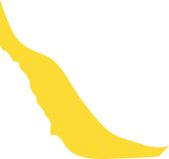 The seeds germinate relatively well, but the process will be enhanced by using Instant Smoke Plus Seed Primer. Germination takes about 3-4 weeks and seedlings should be transplanted when they are large enough to handle. It grows about 0.3 m per year. The tree grows well in a cool or temperate climate with good rainfall and is relatively frost resistant. It makes a good container plant and ornamental tree. Johnson, D. & Johnson, S. 1993. Gardening with indigenous trees and shrubs. Southern Book Publishers, Cape Town. Pienaar, K. 1985. Grow South African plants. Struik, Cape Town.